How Long Does Food Coloring Stay in Your Hair? 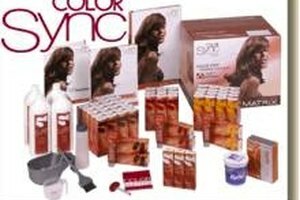 There are numerous ways to color one's hair besides the conventional chemicals in a beauty salon. One method of coloring hair that has gained popularity is to use food coloring. This is appealing because it is inexpensive, readily-available in a lot of homes, and is not permanent. Coloring one's hair is a fun and inexpensive way to change or experiment the look of one's hair. 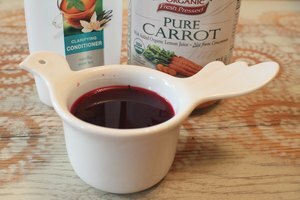 There are countless options for doing this, the most common of which is to purchase hair dye and either apply it at home, or have it dyed professionally in a salon. However, there are other methods for applying color to hair, using either natural substances from mushrooms or plants, for example, or synthetic food coloring, which can be purchased at a regular grocery store. While the colors available in food coloring are somewhat limited -- primary colors are the most commonly available -- it can be fun to mix colors to customize them. Most food coloring purchased in a grocery store is what is known as "dye form," which tends to produce more muted colors and is more likely to bleed. What food coloring is made up of depends on what the color is and how it was produced. Many food colorings are naturally-derived. Many green colors are made using seaweed. Not all food colors are derived from plants, however. Insects are a common source for some colors. Some food colorings, especially cheap dyes, are completely synthetic. Since some food colorings are naturally-derived, this makes the food coloring easier to wash out. Synthetic food coloring may stay in longer. It is common for food coloring to stay in hair for one to three washings. Color fades with each washing. Food coloring can be encouraged to stay in the hair longer. 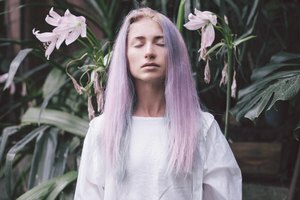 The most obvious way to make it stay longer is to wash hair less, particularly by not washing hair within three to five days after coloring. 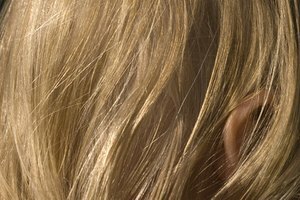 Adding a few drops of hair conditioner to the hair coloring before applying it to the hair may make it penetrate the hair shaft more deeply and thus make it last longer. Shantana Goerge has been writing since 1997, bringing straight-forward communication to a variety of notoriously-taciturn careers, including health inspection, public health education and science reporting. In addition to writing on these topics, she also writes on her other passions: Parenting, spirituality and nutrition. She holds dual bachelor's degrees in microbiology and food science from Michigan State University.